From your search boat, see Jaguars relaxing, hunting and mating. 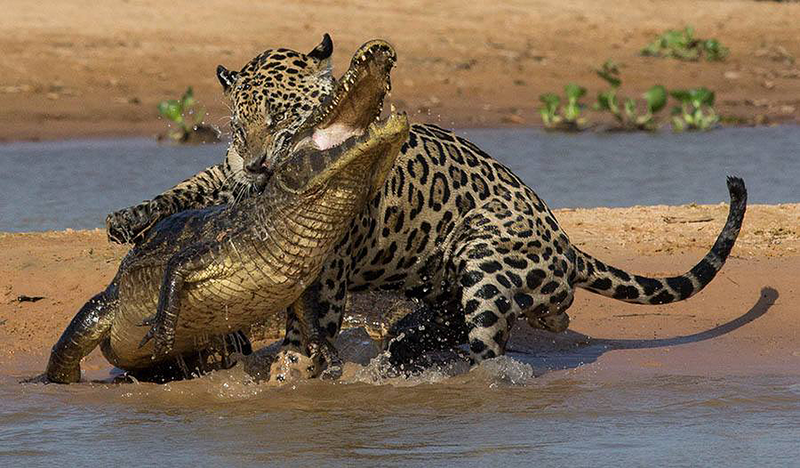 “Mick Jaguar” hunting a Yacare Caiman, Pantanal, Brazil. The Jaguar Extreme trip was outstanding and I enjoyed it very much. There were Jaguar sightings on all but one of my boat trips and I saw seven different Jaguars with some individual Jaguars sighted multiple times. An added bonus was seeing three different Ocelots at the Ocelot Tower. We have Ocelots in Texas, but the chances of ever seeing one are practically zero since they are so rare in Texas. The lodging and food were very good and the guide was excellent. Fiorella was very knowledgeable, helpful and instructive. The presentation by the wildlife biologist at the Flotel was highly educational. Guides were excellent. Our guide Julianna was lovely and had superb English. As she was relatively new to guiding, we were fortunate to also have Rafael, who was very experienced, along with us. Although your information stated clearly that the wolves often arrived after dark, it would have been helpful to know that there was no electricity anywhere near the areas where the wolves usually come, making me dependent on the light from the guide’s flashlight. This, of course, was not true for those who had the sorts of cameras that professionals use. The camps were very basic but completely adequate, clean and comfortable. I do think that the Wolf Camps tour was geared toward expert photographers — which I am not. And, aside from the wolves and the monkeys, I felt that this was very much a birding tour, which was a surprise to me since, in the description, only the Hyacinth Macaws were emphasized. The Southern Pantanal anteater extension was everything I had hoped for. My guide (Marcos Augusto) was fantastic. I have already recommended him to some of my friends. I loved everything about Pousada Aguapé, interesting people, well-organized activities. The personnel were very attentive to what the individual guests wanted to see. The ranch was perfect for wildlife viewing. This was my first time having my own guide, and it was a VERY positive experience. I hope that these remarks are helpful. Thank you so much for all your help with arrangements. We did a combination of the Jaguar Extreme tour and the Southern Pantanal. We saw six different Jaguar over a number of different sightings and even had the privilege of being able to name a Jaguar cub, as the first to sight it. We also saw numerous birds, caiman, Capybara and other animals. A real highlight was seeing a large, 2.5-meter anaconda with a Sunbittern displaying, an extremely rare privilege. In the Southern Pantanal area, we saw several Giant Anteater, including babies and a Collared Anteater, as well as numerous macaws and other birds. We also enjoyed the snorkelling trip and the opportunity to see large freshwater fish in such crystal-clear water. In general, all the arrangements were good. The lodgings were basic but comfortable and clean, and the food was plentiful. Transport was good, although some of the vehicles showed significant wear and tear, particularly those on the Transpantaneira Highway. The guides were very good, friendly, knowledgeable and helpful. We have travelled expensively and particularly enjoy these types of wilderness experiences. I was very happy with the trip and feel it offered very good value for money. Overall, a very enjoyable trip and a fantastic experience. Overall impression — vastly exceeded any expectations I might have had before arriving in the Pantanal. Every time we went out, we saw Jaguar. There were two times that will always stick in my memory. A Jaguar leaping off a 5-metre bank into the river trying to catch a caiman. Not successful, but impressive. The second was similar, but the bank was only 3–4 metres high. Watching this Jaguar stalk the Capybara from above, along the bank, and then leap in after it was spectacular. He did have two goes at it, but again it was not his day. The variety of wildlife was just amazing — I even think I was a converted birdwatcher for the week I was there. Our guide, Naun, was extremely helpful, making sure we got what we required and where we needed to get to achieve all our objectives as far as seeing wildlife was concerned. His knowledge and passion about the Jaguars was abundantly clear, as he always was able to anticipate cat behaviour so he could put us into the best viewing position possible. Food and lodging was great and contributed to a wonderful week. I could not rate the Jaguar Extreme tour highly enough it was so good. We loved our trip to Brazil and Jaguarland. We saw more Jaguars than we expected and even got the chance to name our own Jaguar cub because we were the first to spot and photograph the baby. We saw roughly 10 Jaguars in our 4 days and never went more than 2 hours without a sighting. We also had the extreme pleasure of meeting Dr. Munn at the lodge. He is truly a conservationist with a dream, a vision, and the passion to make real change. We would do it again in a heartbeat – we loved the entire experience. And, we saw no mosquitoes to speak of. We hope to travel with your company again sometime soon. Thank you for your assistance in providing me this tour. Overall, I thoroughly enjoyed the experience. We viewed 10–11 individual Jaguars during 16 sightings. Our guide and boat driver were exceptionally experienced and skilled. Accommodations and meals were impressive given the location. Transportation was efficient and safe. All of the services provided were very well done. We had 16 sightings of jaguars over the course of five days on the river. Some were sleeping. some were walking and one was trying to cool off in the river (he didn’t seem to feel like swimming). I was impressed with our guide, Paulo, who could recognize one jaguar from another if he was able to see their faces. These really are beautiful cats. We also saw giant river otters; caiman, capybara, a tayra (a first for Paulo, and also for all of us), a number of beautiful birds, and piranha. Paulo took a few of us swimming in the Cuiaba River late one very hot afternoon. No encounters with caiman or piranha. Lucy, the manager, was very pleasant and very efficient. Santana, the chief cook and bartender made beautiful caiprinhas com cachaca. Generally speaking, the food was good — some really nice fresh fruits — especially at Southwild Pantanel — and terrific scrambled eggs. The secret of these was undoubtedly the access to fresh eggs from the chickens kept at SouthWild. The boatman on our boat was very helpful to me in pointing out wildlife when I sat at the back of the boat. Bathroom breaks were not an issue; the weather was so hot that almost all of the water we drank came out in perspiration. A special word about Paulo. He made the outings very interesting for us, and showed concern that we were all able to spot the wildlife, whether bird or animal. He is a terrific guide. All was good across the board. Everyone we dealt with was great, including yourself. Great trip! Mind blowing how many Jaguars we saw … 11 different cats and some repeatedly. Action packed start to finish. I am happy with my experience in the Pantanal and with Arcana Mundi. I saw jaguars and lots of other stuff. Meals: very basic. Might be better. The Jaguars certainly did not disappoint. We saw 1 or 2 each day, but sometimes when they were in deep brush in deep shade it was difficult, and in one case, impossible to see the animal. I don’t think anyone was disappointed. What was a surprise to me — and I think to some others in other groups — was how many birds you also can see. We had one man in my group, whom I would consider a real birder, and he saw more than 30 birds he had never seen before. We also were totally taken aback at some places on the road to the Flotel by the really large groups of caiman we saw — so many they were practically on top of each other. We all loved the time in the Pantanal. The accommodations the first and last nights at South Wild Lodge were excellent. The food and rooms were very nice and we bought items at the gift shop. We enjoyed many sightings on the road and the Capybara families and Jabiru Stork nest with babies at the Lodge. The accommodations on the Flotel were very pleasant. Our group on our boat was congenial. We appreciated our guides, boat driver and the evening lectures. Food was OK and plentiful. We were delighted that we had 8 sightings of 5 different Jaguars, many sightings of Giant River Otters, including babies and adults eating fish, many sightings of Capybara, scenes of Caiman catching fish, a scene of a Jabiru catching and eating a fish in addition to feeding chicks and many, many different types of birds. It seems sad that the number of tourists is increasing so dramatically. If the Jaguar stayed awhile in the same place up to 16 different boats arrived to view the scene. It would be good policy to allow only boats with a minimum of 10 people. Our guide said fewer and fewer Jaguars can be viewed. They quickly learn they cannot catch a caiman while all the boats are there. So fewer and fewer Jaguars stick around once the boats begin to arrive. We hope some measures can be taken to protect the practices of the Jaguars. Awesome trip Martin, it all worked like clockwork, thanks for organising it. Had some great photo ops and some are now on my site. Our Jaguar tour was great and we were satisfied !!! ... Everything was great, the guide, the floating hotel, Southwild Pantanal Lodge. Everybody was friendly and helpful. Food was good. Finally, the trip was a success and we got good pictures, as you can see at my website. I am very sure that I will return for another Jaguar trip. Our trip was fabulous. We saw six different Jaguars, many species of birds, and at least a couple of Yacare caiman and Capybara (lol). The excursions from the Flotel were great. Mornings were always the best for Jaguars, though on one excursion in the p.m., we saw a Jaguar swimming across the river in front of us. Never a dull moment seeing numerous birds and caimans. On a couple instances, we saw Howler Monkeys and Capped Capuchins. The outings from SouthWild was always hot and dusty except on the river. Though the area conditions were dry and hot, we saw a fabulous set of birds and Gray Brocket Deer and Marsh Deer. The feeders around the lodge were great for photography. I would suggest they add water for the birds in addition to the feed. Our guide was Fito from Costa Rica. He and our Boat driver (Nito) were fabulous! Great people with exceptional eyes. Both tried very hard to please and help find target species other than the Jaguar. Our room on the Flotel was very spacious with lots of wall outlets though we never had Wi-Fi in our room but we always had it in the meeting room and restaurant. At SouthWild the rooms were very spacious with a lot of outlet spaces and we had Wi-Fi in our room. Americans need to bring wall plug adapters to both places. The food at both places was cafeteria style with numerous choices with a great selection of fruit juices, coffee, water, etc. and alcoholic and soft drinks for additional charge. The people at both places were always friendly and willing to help if they could. Our land transportation from Cuiaba to South Wild was not quite private. We had an additional guest that rode with us. We made two stops, in Pocone for a restroom stop and another one when we officially got to the Transpantaneira Road. We enjoyed both stops! From SouthWild to Porto Jofre it was in an open air truck (safari truck). The road was washboarded, potholed, and dusty but we all loved it. There was always something else to see, especially at the bridges, which there was never a shortage of. We only made a couple of stops. We all wanted a lot more but due to time constraints and connections at Porto Jofre we pushed on. The boat ride to the Flotel was refreshing after the dusty and bumpy road but not as interesting as the safari truck (lol). Great logistics making a complicated logistical trip flow seamlessly. We did return with some fabulous pictures. Thank you!!!! Overall, I would recommend this trip to people who are serious about wildlife and are accustomed to travel in third-world countries. Birders will find it very interesting, as will nature photographers. Wolf Camp: We really enjoyed the set-up. Lourival and his family are a special treat and the relationship between man and beast is just remarkable. Our guide Rafael – absolutely super (intelligent, enthusiastic, knowledgeable, aware of your interest and always tries to accommodate you) – 10/10. Maned Wolves – a real nature experience and excellent photo opportunity – 10/10. Hyacinth Macaws – from a view point were excellent. However, the hide doesn’t allow for panning during the early morning light. Capuchin Monkeys – the two families we visited performed like movie stars – 10/10. Jaguar Extreme: Despite a cold front, where rain and clouds accompanied us for the entire period, we had a most enjoyable time. Excursions, food, accommodation, sightings of especially Jaguars and Giant River Otters were excellent despite the bad weather – 10/10. Our guide Alyson – we had met him at Wolf Camp, where he guided a couple from the U.K. – very, very good (some of the others say he is the best guide on the Jaguars by far) – 10/10. Wildlife photography opportunities – 10/10. Southern Pantanal: Macaws – the set-up is brilliant and observing these colourful birds (who gave us an excellent performance) from the viewing platform is superb – 10/10. Guide – Marco (we had very limited exposure to him – Charles accompanied us to the Macaw Sinkhole; Marco was with us in the afternoon and on the next morning, and in the afternoon Lucy took over. We had met her at Wolf Camp, where she guided two couples from the U.S. and at the Jaguar Flotel. She is an excellent guide, and we can only recommend her highly – 10/10. Ant Eaters – area beautiful and we enjoyed the scenery – 10/10. Guide – Lucy (see above). We also have to mention the excellent driver/spotter, Marco Fernandez – 10/10. Photography – excellent – 10/10. View photos taken on this tour. There were too many good jaguar shots, so I made a video. I hope you like it and thanks for the opportunity. Wonderful staff who greeted us like old friends and, upon departing, ensured they gave us farewell hugs. The two Peruvian staff spoke English very well which made life much easier. Food — hot, varied and very tasty. Great wildlife in close proximity. Varied viewing options; e.g., boat, vehicle or horseback. Wonderful location and wildlife viewing. We were fortunate to have a visiting guide join us for one day on the small boat and Paul, the resident biologist, for another. Their extensive knowledge and ability to communicate made those days very special even if I didn’t get to name a Jaguar! Kay and I have finally returned from our expedition to the Pantanal. We were pleased with our Jaguar and Otter sightings… Our guide, Marcos, was a gem. His English was really very good and his knowledge of the flora and fauna extensive… I found your services to be professional and comprehensive. Again, our deepest thanks for our time with your people in Brazil. We have memories that will last a lifetime. We’ll be happy to act as a reference for any potential customers. “After spending 7 full days with the jaguars, I am even more in love with their magnificence than I was before. During my stay, I had 14 outings occupying the better part of each day and saw multiple jaguars during 12 of those excursions. I had the opportunity to capture multiple outstanding images of these spectacular animals. After my first trip to see them in 2013, I never thought that I would surpass the quality of the images taken during that trip, but I did. I even captured a kill in broad daylight from beginning to end. And as if that weren’t enough, the next evening I saw another kill! Though it was too dark to capture the images digitally, the drama of it all is embedded firmly in my memory. “We had good sightings and the package was well put together as a whole, as well. Almost everything worked as promised, which we consider a very good result in Brazil. Filming from a small boat is heaven for a photographer and hell for a videographer. So I am pleased that I managed to get some decent jaguar material on video. I would say one sighting in four produced usable video footage, so one week is not really enough for more than very basic coverage of jaguar behavior, but that was enough for now. And the Jaguar Suite… was well designed and very comfy. So, we are happy that we chose Arcana Mundi”.